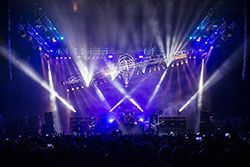 Southampton UK based lighting rental company GLS supplied lighting equipment and crew to Motörhead’s final “Bad Magic” tour that ended in Berlin last December. Unknown at the time, it was the last gig for the heavy metal band whose 40 year career ended with the passing of its iconic leader Ian Fraser Kilmister (Lemmy), on December 28, 2015. The bomber in flight on the Motörhead tour. In Motörhead style, the final tour featured one of the most iconic stage props – the Motörhead bomber – flying for the first time in many years. Caio Bertti, based in Sao Paulo, Brazil, designed the ‘fast-and-furious’ Bad Magic lighting scheme. Bertti had worked with the band for around 18 months. Eddie Rocha, also based in Brazil, managed the tour and production. “Anyone in the industry can recognize a Motörhead song from three chords and so I wanted them to be able to do the same with the lightshow,” said Caio. The four Pointes rigged on the wings were joined by four Robe LEDWash 600s, eight Showtec Sunstrips (active) outlining the 8-meter wingspan, four bars of 4 ACLs, two 2-cell Moles and four single PAR 64s. Its four propeller lights fitted by GLS’s technical department were vintage custom fixtures dating back almost as far as the 36-year-old bomber itself. When flown into its ‘home’ position, the bomber formed an effective mid truss, with two staggered side trusses surrounding it plus an upstage and a front truss. The front truss was rigged with four Robe LEDWash 600s and four 600E Spots for key lights along with eight 8-lite blinders. Spread across all the other trusses were 16 x Pointes, 48 x LED PARs, eight Clay Paky Stormy color changing LED strobes and more standard PARs and ACLs. Positioned on the floor were another 6 x Pointes, 8 x LED PARs, additional generic PARs and ACLs, 8 more Stormy color changing strobes plus four Robe atmosphere generators – two hazers and two smoke machines.